Coffee is widely reported to be the most widely consumed beverage worldwide. Whether it’s a sharp shot of espresso to kickstart your morning, a lunchtime Americano or as fuel to get through a late night at work, coffee makes the world go round. Espresso machines have long since been commonplace in our homes. The more we drink tasty coffee in gourmet coffee shops, the more we want to replicate that at home. Today, though, we will take a look at some far more heavyweight machines. We’ll show you what to look out for if you’re in the market for the best commercial espresso machine. After that, we’ll reviews 8 of the very best industrial espresso machines on the market. If you have a business and want to start serving up top-notch espresso, think of this article as a starting point in your research. These machines are not cheap so you won’t want to make a false move. If you have a hectic, high-end coffee shop where you can’t compromise quality in the quest for volume, the Aurelia II is a must. 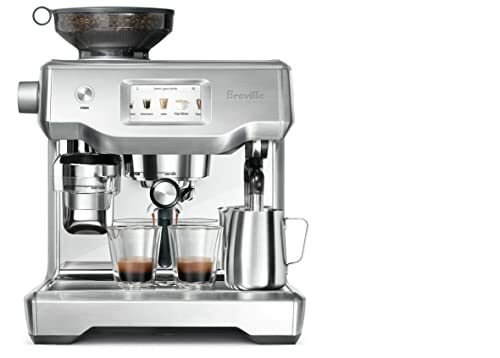 This 2-group espresso machine lets you make hundreds of long or short espressos day in, day out with the utmost ease. For looks and performance combined, the Aurelia II is a standout winner. Best Suited For: Upscale coffee shops or restaurants with heavy volume of uncompromising customers. For a vintage design with contemporary performance, check out this Microcasa Semiautomatica. Incredibly easy to use with no compromise on flavor and results, this espresso machine is ideal for small coffee shops. Maintenance and cleaning is a breeze as well. ​La Pavoni espresso machines are certainly not cheap but they represent outstanding return on investment. The stunning BAR-STAR with water softener included ensures you’ll get the perfect espresso every time. Gaggia are a heavyweight in the coffee industry and this fully automatic espresso machine is ideal for busy restaurants and coffee shops. From jaw-dropping aesthetics through to a cup warmer and dedicated hot water dispenser, give your customers the coffee they deserve fuss-free. Stepping up a gear with this 4-grouphead machine, make over 1000 cups of mouth-watering espresso and cappuccino each day with this La Pavoni. Super-simple to operate and able to make 8 coffees at once, this giant machine is not cheap but the best things in life seldom are. The Rolls-Royce of espresso machines, this beefy 4-grouphead from Nuova Simonelli allows for a great deal of customization without becoming too difficult to operate. From rich espresso to creamy cappuccino, this outstanding machine produces coffee at its very best. 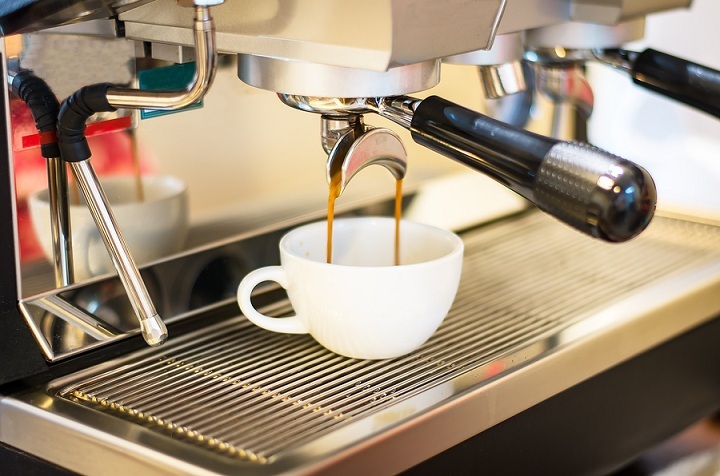 Whether you have a coffee shop, a restaurant or any other business where you want to make great coffee on a large scale, choosing the best commercial espresso machine will be fundamental to your success or failure. Customers are bewildered with choice these days. You need a USP and if you make your business stand out by delivering top-notch espresso, those customers will show their loyalty with repeat business. The success of your business depends on making the best decision when it comes to your coffee maker and we are here to help. Perhaps the most crucial element of your research is being honest about the size of your business and how much trade you will do. This will affect the scale of the coffee machine that best fits your needs. The larger the number of groupheads, the more staff can simultaneously use the machine. Analyze your business and ask yourself if you need to prioritize a machine that will maximize the number of coffees you produce or whether you could settle for a 2 grouphead machine. The good news here is that the only difference between these machines is the efficiency factor so if you have a little café or a limited drinks menu, a smaller machine will deliver outstanding coffee without compromising on performance. Getting the size in place makes the rest of your purchase easier as your options will be thinned down. Cash rules when it comes to any purchase but it’s not purely about the bottom line. You are making an investment in your business so you should look to spend what it takes to get the best solution for you. There is no one-size-fits-all answer. Price varies quite drastically in the field of commercial espresso machines. Brand name is always a driving factor in this. The mechanics and diagnostic functionality will also have an impact on price. If you are clear about your needs and set a firm budget, getting a cost-effective commercial espresso machine need not be a headache. We’ll look now at some of the ways in which these coffee makers differ. The size of the boiler plays a key role in your machine’s ability to dispense hot water and deliver steam. Your espresso production will be least affected by boiler size while using hot water will consume the most power. If you have a restaurant and serve a few espressos or some 6 oz single cappuccinos, you do not need to focus so much on this side of performance. Those who sell a high volume of takeouts, lots of 16 oz grande or 20 oz vente, need to prioritize a boiler size in line with the job. While the delivery method is obviously critical, the way in which your machine delivers is equally important. As mentioned, you can have a one group machine but for commercial purposes, the machines usually come with two, three or four groupheads. For small restaurants serving coffee to seated customers after their meal, a one group might do the job but most commercial outlets opt for the versatility and extra production capability of a two group machine. Busy takeway outlets or kiosks at an airport will experience much higher demand and a three group machine is better suited. Large coffee chains with a heavy throughput of customers need the added scope of a four group machine. You can then enjoy making up to 8 cups of coffee at the same time. Four group machines are the most expensive by far and comprise only a small percentage of the market for commercial espresso machines. The element rating or electrical draw of the espresso machine will affect how quickly it recovers from heavy use. Do you have a morning or lunchtime rush? Do you serve mainly Crema coffee and Americanos? If so, you’ll want to look for a higher capacity machine. Check closely as these ratings vary quite dramatically depending on the manufacturer. The driving factor for good espresso is the temperature of the water. The ideal temperature is 95C or 203F. Using a pressurestat or thermocouple, boiler pressure and water temperature can be easily adjusted. Being as little as 1 degree out temperature-wise can negatively impact the quality of the coffee. Get it correct. It’s no use having the best available coffee machine if it’s too tricky to teach staff to use. Think about how easy it is to train people to use the machine and choose wisely. Is the machine easy to clean? Is it simple to operate the steam valves and hot water valves? Is the cup warming area large enough for your needs? Appearances count and when it comes to aesthetics, not all espresso makers are created equal. Firstly, think about the color scheme and how the machine will look in your establishment. Counter presence is the perceived value of a larger machine in the eyes of customers. They think that a bigger machine is more professional and this can have a positive effect on your business. Think carefully about what size will have the best overall benefit and buy accordingly. 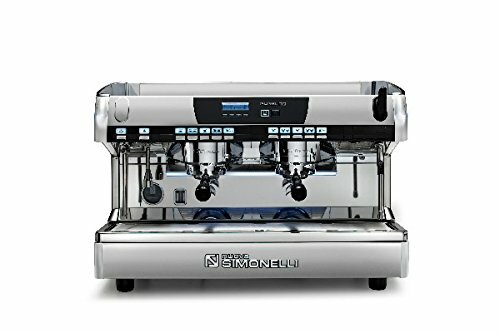 From the sleek silver finish to grace any counter through to the nifty LED lights for working safely in dim environments, this commercial espresso machine is a real powerhouse. It’s no surprise at all that the Aurelia Ii from the legendary Nuova Simonelli was named as the official espresso maker at the World Barista Championships for 3 years straight so who is it for? Well, if you have a seriously high volume coffee shop and you need to make several hundred stacked espressos each day, the Aurelia II is perhaps the smartest investment you could make for your business even though it’s brutally expensive. The Aurelia II is not a case of form over function, either. As well as its stunning looks, functionality is unparalleled. For such a complex machine, it’s incredibly simple to use. The reverse mirror is a slick touch enabling you to see the shot without crouching down. The user-friendly, programmable nature means you’ll be able to train up any new baristas in minutes and they’ll be serving espresso in short order. Of the 4 models available, the Volumetric we checked out differs from the Semi-Auto in that it shuts itself down automatically. You’ll be able to program each of the group heads in 4 ways (single or double short, single or double long). There’s also a manual override. The soft infusion system (SIS) sees a chamber inside meaning you’ll get a deliciously creamy espresso with no harshness. Even an untamped shot will be serviceable. Although we wouldn’t recommend skipping the tamping stage, we mention this to illustrate how forgiving the Aurelia II is. If you want that rare combination of quality and quantity in espresso making machines, you simply can’t go wrong with the Nuova Simonelli Aurelia II. If you’re looking for a user-friendly espresso machine suitable for commercial use, Elektra’s Microcasa is a smart bet. Although it might look complicated at first glance, this espresso machine is simplicity itself. With just 3 buttons (power, boiler refill and coffee brew), your customer will have no reason to suspect this machine does all the work without any fanfare. Proper temperature is key when you’re making espresso. Although the water reservoir is fairly small at 2.1 – 2.3 liters, it keeps the water at just the right heat for the most delicious espresso. Once your drinks are made and extraction is finished, a superb 3-way valve takes away pressure nicely from the grouphead. Cleaning couldn’t be easier and there’s almost no maintenance required. The Microcasa is reasonably priced for a commercial machine. Check one out and start serving up top-tier espresso tomorrow! This traditional design finished in copper and brass is the perfect addition to any small coffee shop. Next up is a much more expensive espresso machine from the legendary La Pavoni. In business for over a century, this Italian company has served up a retro-looking machine with a sharp focus on modern technology. This 2-grouphead machine will enable you to make up to 4 espresso, ideal for your busy establishment. You’ll get a large 12-liter water softener thrown in. Hard water is less than ideal for espresso so this is a lovely touch. Electrical output could be higher but it’s more than fit for purpose for a smaller 2-grouphead machine. If the bright red design is not to your liking, you can also get the BAR-STAR in an understated black. For impeccable coffee every time, you can’t go wrong with the BAR-STAR. Another La Pavoni up next, an expensive but outstanding 2-grouphead espresso machine with a generous 14l boiler. For machines used in a commercial catering situation, speed is of the essence. While some automatic machines have sluggish electronic pumps, that’s not the case here. Separate solenoids allow 2 users to make different drinks simultaneously which is highly beneficial in a restaurant or coffee shop. You can also check the boiler pressure and pump at the same time so it’s a multi-tasking machine all the way. Build quality is second to none with chrome-plated brass groupheads built to stay the distance. For a slick and effective espresso machine that demands minimal user interaction while delivering world-class coffee, you can’t go wrong with an La Pavoni appliance. Gaggia produce professional-grade coffee machines that impress on every level. From the muted steel finish through to the pre-warming facility, there’s little to knock about this fully automatic espresso machine. You can operate each grouphead independently so there’s no need to wait around and you can get the most out of the 4-cup capacity of the Gaggia all day long. The beauty of the dedicated hot water dispenser is that you can make a range of drinks with absolute ease rather than being limited to espresso only. The cup heater is a great extra and ensures that your customers can enjoy a steaming espresso just like they would get in Italy. This commercial-grade Gaggia delivers in fine style. This 3-grouphead from La Pavoni will make an elegant addition to any catering business. The black and silver design is a nice twist of old and new. With this bulkier machine, you can make up to 6 espressos without breaking your stride so it’s a winner for busier cafes or hotels. Although the price might pull you up, if you’re buying a machine for commercial, purposes, you need to think of it as an investment rather than an expense. You could pay more for less so it’s not such a bad deal all things considered. Intuitive, easy to operate and guaranteed to yield top-notch espresso even under heavy punishment, simply pull the levers and leave the rest to the machine. For busier coffee shops or other hospitality venues, there’s no substitute for a 4-grouphead machine. This awesome piece of kit, again from La Pavoni, lets you make up to 8 drinks at the same time and keeps going to produce 1000+ cups in the course of a single day. This kind of functionality doesn’t come cheap so expect to pay approaching five figures for this 250-pound beast. Whether you want espresso or cappuccino, you can keep banging out the coffee without your customers getting impatient. For a truly impressive commercial espresso machine that looks great and performs even better, this 4-grouphead from La Pavoni excels in every regard. Rounding out our look at the best commercial espresso machines, here’s an incredibly expensive 4-grouphead from Nuova Simonelli with functionality to match the price tag. This tech-driven espresso machines is designed so you can work throughout the day dispensing coffee after coffee with no discomfort or drop in standards. Nuova Simonelli’s SIS (Soft Infusion System) ensures that pre-infusion is neatly controlled at low pressure. The result is a superior shot of espresso each and every time. You can exercise full control over the temperature in a way not possible with most other espresso machines. For more variety, this machine will also deliver creamy cappuccino courtesy of the auto steam wand. If you want an all-dancing commercial coffee machine that really is second to none, you owe it to yourself to check out this awesome 4-grouphead from Nuova Simonelli. We hope you have enjoyed our glance at what to look out for when you’re looking for the best commercial espresso machine useful. Please don’t hesitate to get in touch if you have any questions or feedback. We are always delighted to hear from our coffee-loving readers. Now go and get that espresso rolling! I want to get a commercial espresso machine! A very small restaurant and wanted to learn with the coffee business! Please give me some more info or do you have another suggestion for me!